A bassinet pad is the mattress on which a newborn baby will spend a great deal of his or her time. Any parent will want that baby to be cradled safely and comfortably. Babies prefer the confined environment of a bassinet where they feel safe, and standard sizes for bassinet mattresses are 14 x29 inches or 15 x 30 inches, usually with rounded corners. The pad itself may be made of anything from inexpensive polyurethane foam to food-grade polyethylene. Polyurethane foams exude fumes for the first few weeks, so buying well in advance will be safer for the baby. Although there are standards set by the EPA, some babies are more sensitive to these odors than others. Both kinds of foam give off toxins when burned. 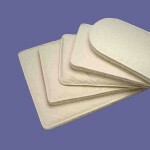 Bassinet pads have a variety of covering materials. At the budget end of the spectrum is vinyl. This is easily cleaned, but may not be comfortable or soft. Vinyl is also subject to drying and cracking over time. Expensive bassinet pads may be covered with non-allergenic, organic cotton, with a food-grade polyethylene coating to make it waterproof. Pads and their covers are treated in some way to meet flame retardant standards. Recent research suggests that the risk from these chemicals outweighs the benefit, but all pads will be treated. Parents may wish to research the risks of the various retardants to help guide their choices. 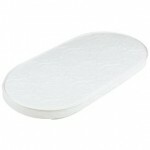 Finally, Some bassinet pads are treated with antimicrobial biocides, to help prevent the growth of germs in the pad. Some parents may welcome such protection, others will prefer organic materials. Generally, organic fabrics will be the more expensive option. In addition to the pad itself, many of the same issues will be faced with the selection of sheets, bumpers, and other bassinet bedding. People should realize that not all bassinet pads are the same. There is a wide range of choices, and reading labels and manufacturers web sites can help guide parents in making the decision which will be best for their baby. This entry was posted on Tuesday, April 14th, 2009 at 9:59 pm	and is filed under Bassinet Guides. You can follow any responses to this entry through the RSS 2.0 feed. You can leave a response, or trackback from your own site.